LITHIUM DENSIFIER PREMIUM is an oil resistant concrete densifier containing lithium silicates. Unlike concrete coatings, LITHIUM DENSIFIER PREMIUM is a non-film forming penetrating sealer which penetrates and blocks the concrete capillaries, hardens the surface, and enhances the colour of the concrete surface. Further, this densifier sealer imparts excellent oil resistance to the concrete and effectively makes an oil-proof concrete finish. A smooth or gloss finish can be achieved by concrete polishing. Due to the smaller molecule and high activity of lithium silicates, LITHIUM DENSIFIER PREMIUM can deeply penetrate into the capillaries and quickly react with concrete resulting in quick and efficient concrete polishing process. Unlike sodium densifiers, LITHIUM DENSIFIER PREMIUM unlikely leaves visible residues or efflorescence after the treatment. LITHIUM DENSIFIER PREMIUM is used as an oil & water resistant concrete densification sealer for concrete flooring including residential garages, commercial car parks, restaurants, factories, shops or warehouses. 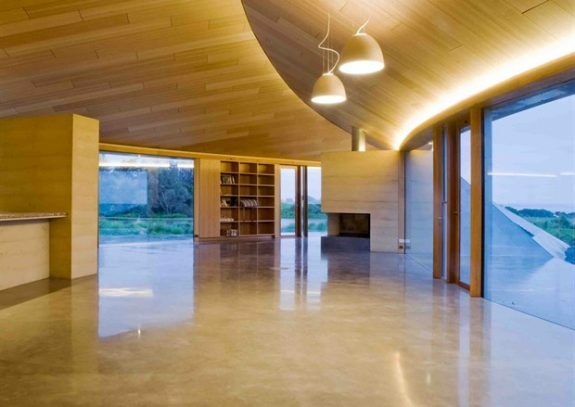 Applications include treating polished concrete floors or bench tops, and sealing old concrete for strengthening, dust-proofing, oil and water-proofing. LITHIUM DENSIFIER PREMIUM provides excellent resistance to oil penetration or oil staining. The sealer may also be used for sealing other masonry substrates including natural stone, clay bricks or ceramic tiles. However, a test should be conducted prior to application to determine the suitability of this product for the purpose. Prior to application, the concrete surface should be completely cleaned of any surface contaminants that would impede the penetration of LITHIUM DENSIFIER PREMIUM, and allowed to dry before application. New concrete should be properly cured. Curing compounds, release agents, or coatings/membranes should be removed from the surface, cleaned and allowed to dry before applying LITHIUM DENSIFIER PREMIUM. In the case of acid treated concrete, the concrete surface should be completely neutralised and thoroughly rinsed with water, and allowed to dry before application. For polished concrete, the surface is firstly removed by grinding to 200grit or desired finish to expose the aggregate before applying the sealer. This will ensure maximum absorption of the sealer and make it easy to further polish to finer grades due to the densification achieved by LITHIUM DENSIFIER PREMIUM. LITHIUM DENSIFIER PREMIUM may be applied with a low pressure hand sprayer, mop or soft bristle brush/broom. The sealer should be evenly flooded onto the surface. Puddling should be avoided. Ensure the sealer is present on the surface as a mirror-like wet film for up to 10-30 minutes to ensure maximum absorption. The second coat is applied immediately if the first coat is absorbed by the surface while the surface is still wet (wet-in-wet method). Avoid applying the sealer if the surface has dried. Remove the excess sealer from the surface if the sealer is not absorbed by the surface after 10-30minutes. The excess sealer may dry to cause unwanted residue on the surface which may only be removed by mechanical scrubbing. If a good oil and water-resistant result is required, the above wet-in-wet application may be repeated several times on the one occasion to ensure enough sealer is applied onto the surface. It may help to achieve better penetration by pre-dilution of the sealer at 1:1 with clean water before application. More wet-in-wet applications are required to ensure enough sealer is applied. A test should be conducted before application. The area may be further polished or buffed after the surface has cured and dried. LITHIUM DENSIFIER PREMIUM should be applied after every polising. For additional water or oil resistant treatment, TECH-DRY oil and stain resistant sealers may be used as the top finish. Contact Tech-Dry on (03) 9699 8202 for further information. The LITHIUM DENSIFIER PREMIUM application rate varies depending on porosity of the concrete and climatic conditions. 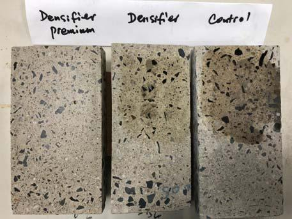 Dense, smooth, or new concrete may have a low absorption rate, whereas porous and old concrete may absorb significantly more sealer. The consumption rate varies from 5-25/m2 per litre per coat, or could be out of this range significantly. Curing starts immediately and full curing may take up to 24 hours or more. Avoid heavy traffic for 24 hours. Wash all equipment in water. LITHIUM DENSIFIER PREMIUM was applied to a concrete polished with 50 grit resin finish. 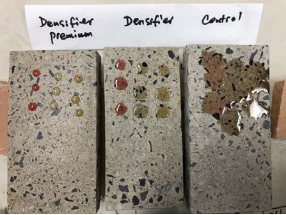 The same concrete treated with a normal densifier and an untreated sample was used as the comparisons. The treated concrete was cured for 7 days before oil and water resistant tests were conducted. Figure 1 shows the capillary water absorption of the concrete treated with LITHIUM DENSIFIER PREMIUM. 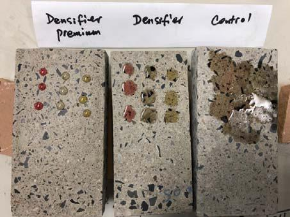 The results indicated that the water absorption of the treated conrete was significantly reduced compared to that of the untreated concrete. The oil resistant test results are shown in Figure 2, 3 & 4. In this test, oils (engine oil,olive oil & heavy engine oil) were placed as oil droplets on to the treated surface. The oil droplets were kept on the surface for 24 hours. The oil repellent effect (beading effect) was checked at the start and the end of the test. Oil stains on the surface were examined after the oils were removed from the surface with a paper towel at the end of 24 hour test period. The results in Figure 2, 3 & 4 clearly indicated that the surface treated with LITHIUM DENSIFIER PREMIUM has shown excellent resistance to oil penetration and oil staining. LITHIUM DENSIFIER PREMIUM penetrates and blocks the concrete pores or capillaries, and hardens the surface while making the surface oil and water resistant. However, the degree of surface hardening and oil or water resistance depends on many factors which are out of the manufacturer’s control. It is highly recommended that a pilot test should be conducted prior to application to determine the suitability of this product for the purpose. If in doubt, please contact Tech-Dry on (03) 9699 8202. Handling & Storage: LITHIUM DENSIFIER PREMIUM is an alkaline solution. Skin or eye contact should be avoided by wearing proper protection. The risk of vapour inhalation of the sealer is low, however, an air-purifying respirator should be worn if there is a risk of exposure to high vapour concentrations. Wash hands after handling. The sealer should be kept in the sealed original container under 25°C. The product be should used within use-by-date. The sealer should be used up as soon as the original container is opened. LITHIUM DENSIFIER PREMIUM is available in 20 litre plastic containers. Other size package is available on request.